An increasing but still contested body of science suggests that rapid and intense warming in the Arctic actually is triggering changes in the jet stream that can affect weather far to the south. So these stories were accurate — as far as they went. But as it turns out, intense Arctic cold snaps like the one at the end of January have become less widespread and common as the globe has warmed due to human activities, not more so. And so by downplaying or even leaving that key bit of context out, some of the coverage didn’t go far enough. The red, downward-pointing symbols tell the tale. They show where unusually cold days have become less common over time. Meanwhile, the blue symbols show were cold snaps have become more common. As the graph shows, since about 1980, the percentage of the contiguous 48 states that has experienced particularly cold episodes during winter has dropped significantly. Kenneth Kunkel, a researcher at North Carolina State University who studies extreme weather in the long-term context of climate, notes that past North American cold waves have been much worse than what we’ve experienced in recent years. Quoted by my colleague (and long-time friend) Andrew Revkin in National Geographic, Kunkel cited cold waves in 1936, 1970, 1977, 1983, 1989, and finally 1996. This is not to say that extreme weather outbreaks possibly resulting from amplified warming in the Arctic are insignificant. They may well be yet another symptom of the climate system becoming increasingly ornery as we’ve poked at it with the big stick of heat-trapping greenhouse gases. Like a grizzly bear, you never quite know just how the climate beast will respond when you make it angry. Sometimes, it will surprise you. We also need to keep our eyes on the overall trend: Although winter hasn’t been repealed, and cold snaps obviously still occur, over the long term, the globe is getting warmer overall, and brutal Arctic outbreaks will likely continue to be less common and widespread. Some might be tempted to conclude that global warming is therefore a good thing. But here’s the thing about wild beasts: Once they get angry enough, they can hurt you real bad. Since the total amount of greenhouse gasses in the atmosphere is the product of many different nations, with many different national priorities and policies, getting them all on board with a plan that would make a significant difference is virtually impossible. Whatever is going to happen will take many decades to unfold in a significant manner, making gradual adaption feasable. It’s actually underway now, and accelerating. Complacency is a recipe for disaster. Continuing and growing investments in alternative energy, including wind, solar, and safer nuclear. Moving away from reliance on fossil fuels, and research into carbon neutral biofuels. If feasible, carbon sequestration underground, planting more forests, and protecting what remains of rainforests in the Amazon and Indonesia. More fuel efficient automobiles, and providing better infrastructure for increasing numbers of electric vehicles. These are just some of the steps that can be taken to prevent the worst case scenarios, but we will still need to also look at mitigation for the rising sea levels and increasingly severe weather events that we have already committed to with the currently high atmospheric CO2 levels. 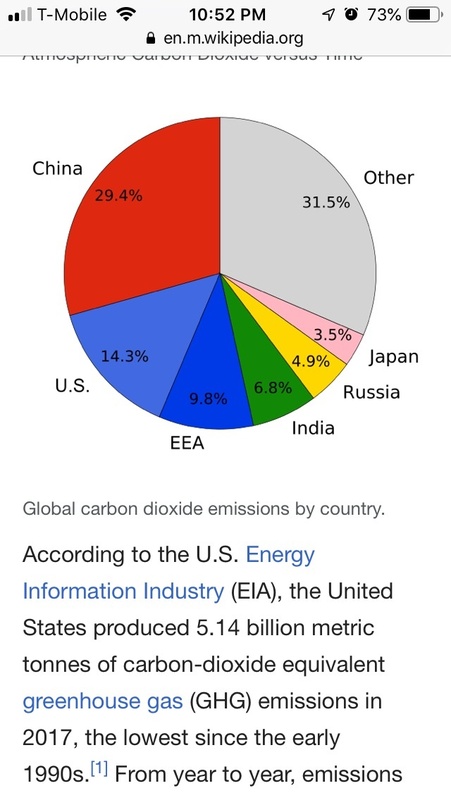 The U.S., Europe and Japan contribute less than 1/3 of total global greenhouse gas emissions. The U.S. is at the lowest level in 30 years. 2/3 of total emissions are by China, India and other countries trying to climb out of subsistence living. They will not give up that ambition. Nor will they chose to delay it by throttling back the use of the most convenient, available and cost effective forms of energy – coal and oil. We can tweak around the edges to lessen our 1/3 share but the solutions you point out have limited appeal or feasibility for countries responsible for the other 2/3. You know what country also leads in installed solar power? China. You can also check that on Wikipedia. They are now leading the U.S., which is not a state of affairs this country should tolerate. We need to lead by example, and encourage China and India to continue expanding alternative energy as we do as well. Using China’s current emissions as an excuse to do less ourselves is irresponsible. We account for 14% of global emissions, and have slashed our emissions to the lowest level in nearly 30 years, so even though there is always room for improvement we are already doing our part and then some. It is arrogant and condescending to think that the Western countries can pontificate (“lead by example”) to China, India and “Other” who account for 2/3 of emissions, when they have their own particular national problems and priorities for their people – they’ll listen as well as we listen when other countries wag a finger at us. Particularly since it’s already rich nations lecturing nations struggling to become middle class, let alone rich; think about the psychology of it. The solution isn’t hectoring or apocalyptic catastrophism, let alone government diktat. The solution is presenting alternative sources of power that are MORE convenient and cost effective than carbon, or nations / individuals won’t adopt them, it’s that simple. The solution is not denialism, fatalism, or nihilism, yet that seems to be your argument here. I should have known from your username and avatar that you had a certain ideological viewpoint you were pushing, and that you and your views should be treated as seriously as those identifiers. Fortunately, more and more people are doing just that. Well, what do you know: Some actual science dealing with Climate Change. Now, that wasn’t so hard, was it? I wonder why the baseline for the map starts in 1948, but the graph begins in 1911. It raises a red flag. That said, the map starting in 1948 would include the almost forgotten period of cold years in the 1950s that ended the use of lupin as a winter cover crop in the Southern US. I’m amused that, right at the first, it contradicts various articles, including the one in Discover I cried foul about. It will be interesting to see how many will hold that both articles are correct. …and the US Midwest is essentially unique in the world in having these cold snaps as a result of global warming. At the very same time Minnesota was hitting 20 below, Sydney was experiencing its hottest weather on record. “…and the US Midwest is essentially unique in the world in having these cold snaps as a result of global warming.” ?. You do know why “unexpected” is in the title ? You do know co author Dr.Johm Fyfe ia an IPCC lead author who confirmed the “Hiatus” in 2013 and 2016 ? Thought you might be interested … but ,perhaps the destruction of the global warming causes cooling is just too painful ? Why would it be unusual for Australia to be experiencing warm weather while we are getting cold weather? After all, it is their summer down there. Well, it would be unusual, Rocky, because it’s never happened before. This is what “hottest weather on record” means.